The 5th generation medical carts technology - Ergotron?s StyleView is the genius working behind and fitting the technology to the healthcare operation & workflow. You can easily personalize your cart to suit your team?s work style and flow. StyleLink with PHD drawer management capabilities, you can install, access and manage your carts? power systems and PHD drawers from a remote location across WAN, LAN, or VPN. Three-part software package with enterprise capabilities optimizes your IT tech-support time by giving real-time centralized control over carts across campus, city, country or the world. From the design to the implementation of bar code and electronic advance shipment notice, GS1 Hong Kong has contributed their expertise , solutions and vendor engagement support to Hospital Authority (HA) in the past 2 years, in order to facilitate the supply chain modernisation of pharmaceutical products for improved control measures and automated operations. Like many other projects, there were challenges popped up in the course of the preparation where the GS1 project team struggled with them for the time being because all of them could hinder the implementation. The speaker will share how the GS1 project team work with the HA to address the challenges and what the lessons learnt. Joe has worked at Ergotron for over 2 years. He is an expert in supporting different hospitals to optimize their workflow; improve their productivity & wellness; locate the data to where the doctors and nurses need. Before joining Ergotron, Joe has worked in Oracle, Dell and etc., specialized in working out the practical IT solutions to optimize the actual workflow for different hospitals. Joining GS1 HK in 2006 , Mr KC Leung was responsible for the customer service and the implementation projects in regards of GS1 Standards, bar code quality verification service, e-Commerce platform and the global product data synchronization network for local industry. He has then taken the consultancy role from 2011 to promote and implement the GS1 standards in the healthcare and logistics industry: main projects are Supply Chain Modernisation Project of Pharmaceutical products of the Hospital Authority of Hong Kong in 2012, and the Feasibility Study of Supply Chain Visibility funded by Hong Kong government for the logistics industry. He graduated from the Chinese University of Hong Kong, majoring in Systems Engineering and Engineering Management with specialization in logistics and supply chain management. Deadline for registration is 9 Aug 2013 before 5:30pm. 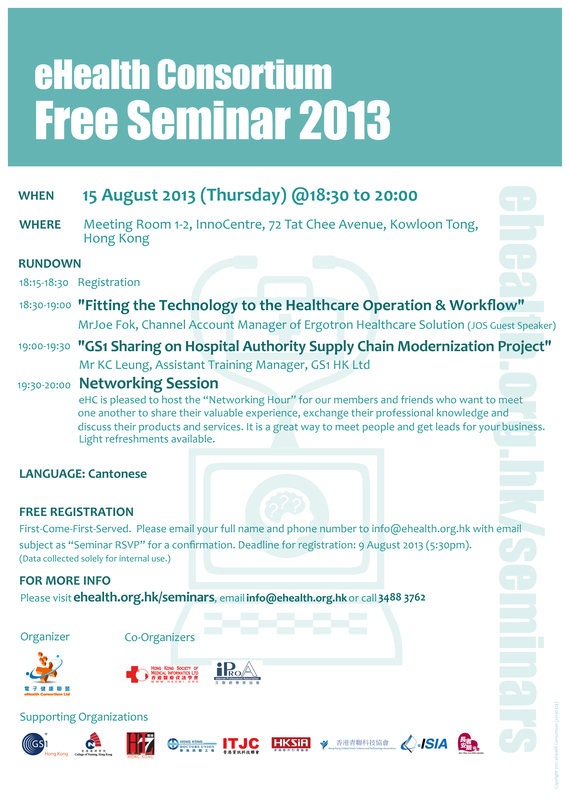 Please email your full name, phone number and occupation to info@ehealth.org.hk with email subject as ?Seminar RSVP? for a confirmation. (Updated on 29 Jul 2013) Stay tuned for information on our next seminar in Sep !